An account of most of World War Two as experienced by a resident of Lowestoft. Alfred J. Turner (AJT) was my great grandfather and this account is his, based on the drafts of weekly letters of local Lowestoft news that he wrote to his son, John Pater Turner, from November 1940. These drafts cover the daily events but also include the rumour, speculation and gossip which brings the account to life as a story of real people. John P. Turner (JPT), my grandfather, was living in Berkshire where he taught chemistry at St. Bartholomew's Grammar School, Newbury. His family unit there in Howard Road was his wife, Scylla and their three children Keith (killed 1945), Margaret (my mother) and Michael. The draft letters were discovered in 1995 when, as co-executor with my uncle Michael of my grandmother's (JPT's widow) estate they were found in Walmer House, south Lowestoft, where AJT lived throughout WW2. For those not familiar with the area, Lowestoft is the most easterly town of England. In peacetime it had been a thriving fishing port and seaside holiday resort but during WW2 it became important to the war effort, a fact well recognised by the enemy. It was within the potential invasion area and by the end of the WW2 there were five separate naval bases in the town as well as an army presence to brigade level, with coastal defence guns, anti-aircraft and searchlight units in strategic places. Lowestoft was also a navigational point for the many British and American aircraft going out daily to bomb Germany. 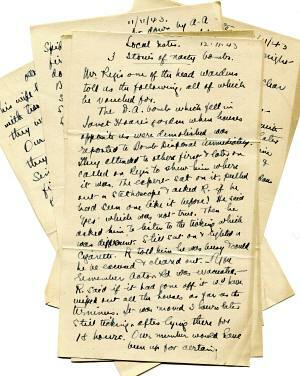 The fair copies of the letters were sent and have been lost but the drafts contain enough detail of their content to paint a fascinating picture of Lowestoft during WW2. Most references to people and places have been identified and where necessary explanatory notes have been added in the text or in the Glossary. Cross referencing with notes from some factual post-war records of contemporary events helps to put the letters in context. In editing some further details have been added to expand on events, to explain comments about family members, about the house where AJT lived and where JPT and his family visited during the school holidays (and which was my home until work and marriage took me away in the mid 1960's), and about the layout of Lowestoft at the time, as it was before all the post-war re-building and development. The pages of background present some images of the people and places involved and the two glossaries give some further background information. Sadly there are some gaps. Some can be explained by the fact that the Newbury branch of the family was visiting Lowestoft and so letters for that period were not written but there are gaps at other times for which there is no explanation. Enough remains, however, to provide a slightly disjointed narrative of five years of war in Lowestoft. If you prefer, miss out the added details and go straight to the letters. You can always refer back if you want to, or look up names and/or places in the glossaries.